Diwali was so fun this year. Days just went by so quickly. 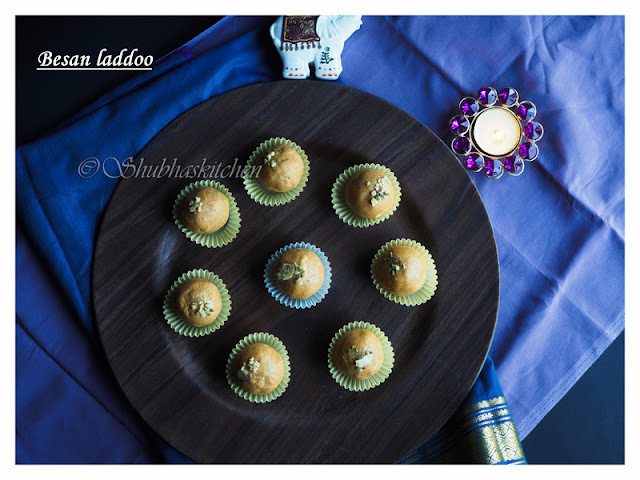 I had prepared this post half way through before Diwali but did not get around to posting it :/ Now that all the festivities and parties are over , its time to get back to blogging. 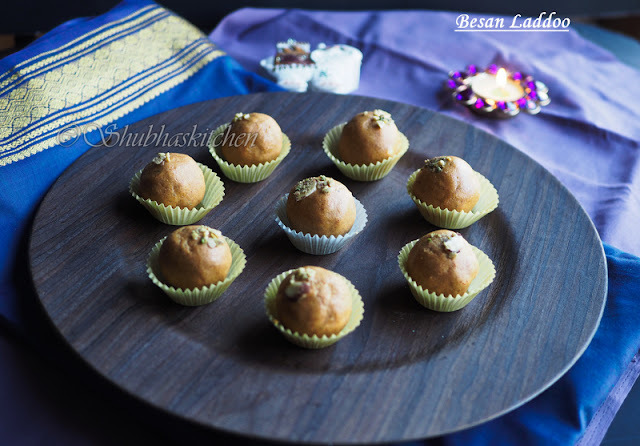 Some time back, I had posted the recipe of Besan Laddoo (Recipe link here). 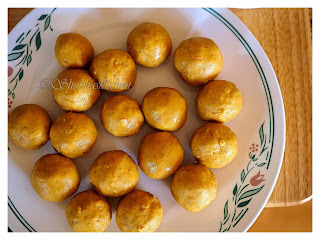 Its my most favorite laddoo. 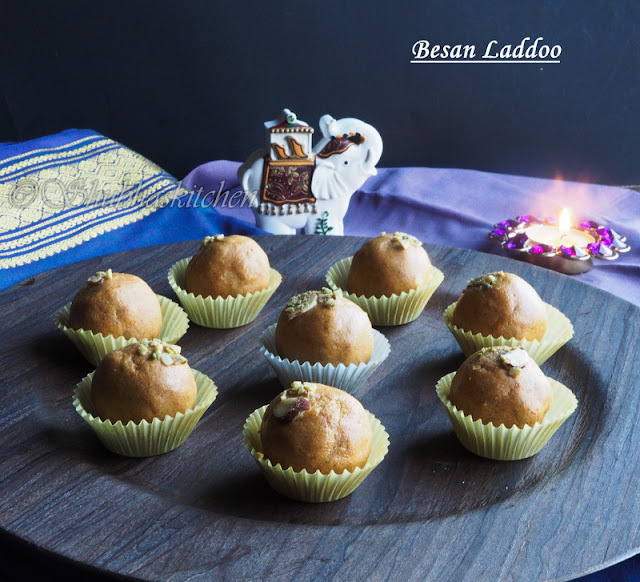 I have heard from so many friends of mine that they shy away from making Besan Laddoo because its so time consuming. In the traditional method of preparation, you would need to roast the besan for a good 30-45 minutes. So this time around for Diwali , I tried making them using the Microwave method. It was just amazing , the entire process of roasting the besan / chick pea flour in ghee / clarified butter was done in about 10 minutes. Once done, I let the mixture to rest until it reached room temperature. Then, added the powdered sugar, cardamom powder and chopped nuts. Mixed it well and then made laddoos. They were DELICIOUS. There was no compromise on taste plus it was so easy to make with the microwave method. 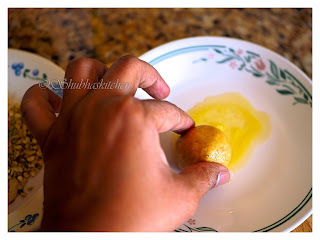 Take ghee in a large microwave safe bowl and heat it for 30 seconds or until the ghee has melted.Now add the laddoo besan / coarsely ground chick pea flour . Mix well. Heat the mixture for 2 minutes. Remove and mix well. Continue heating now in 1 minute intervals stirring in between.Continue heating the besan-ghee mixture until you get the nice aroma and the color changes to darker shade. (It took about 10 minutes in total . This time might vary depending on the rating of the microwave).Once done, set it aside to cool down to room temperature. Add the powdered sugar, cardamom powder and chopped nuts. Mix well. For a special garnish, take some EVEREST MILK MASALA in a plate, melted ghee in another plate. 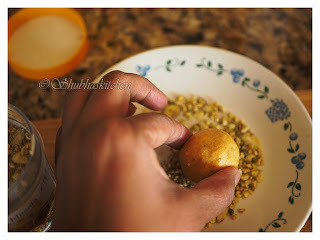 Dip a laddoo lightly in melted ghee and then dip the laddoo in EVEREST MILK MASALA. Please do try.. hope u like it!! Yes, very true.. I feel handicapped without a microwave.. Thanks for writing! !